Note: Regions are natural gas supply regions from the National Energy Modeling System. 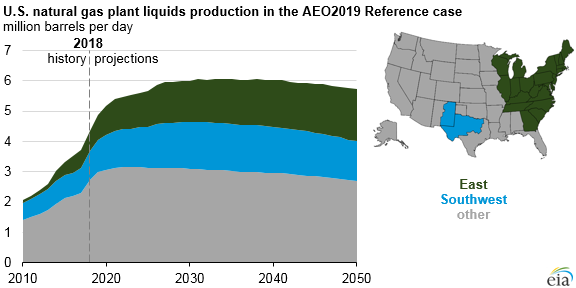 In EIA’s Annual Energy Outlook 2019 (AEO2019) Reference case, natural gas plant liquids (NGPL) production grows by 32% between 2018 and 2050 to 5.8 million barrels per day (b/d). Most of the increase in production is in the East, specifically the Appalachian Basin, and the Southwest, specifically the Permian Basin. Given projected crude oil and natural gas prices, producers are expected to focus on liquids-rich plays, and NGPL-to-gas ratios are highest in these areas. In addition, increased petrochemical feedstock demand spurs higher ethane recovery. NGPLs are light hydrocarbons produced in conjunction with natural gas and recovered at natural gas processing plants. These hydrocarbons include ethane, propane, normal butane, isobutane, and natural gasoline. Crude oil refining also yields these hydrocarbons, but in 2017, U.S. refining accounted for slightly more than 8% of net production, with nearly 92% produced at natural gas processing plants. NGPLs are primarily used as feedstocks in the bulk chemical industry. Ethane is used almost exclusively for producting petrochemicals. Approximately 40% of propane is used for petrochemicals and the remainder is used for heating, grain drying, and transportation. Approximately 67% of butanes and natural gasoline are used for blending with motor gasoline and fuel ethanol, and the remainder is used for petrochemicals and solvents. The shares of NGPL components at the national level in the Reference case are relatively stable during the entire projection period (2018 to 2050), with ethane and propane contributing about 42% and 30%, respectively, to the total volume. However, these regions have some differences. 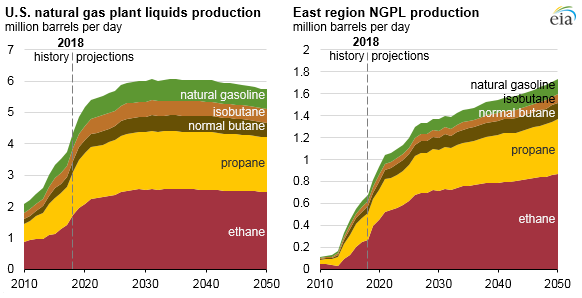 In the East region, ethane production accounts for about 50% of the total NGPL production by 2050, compared with less than 40% in 2018. NGPL production is sensitive to changes in market conditions and resource and technology assumptions. AEO2019 includes cases that reflect alternative oil prices and higher or lower resource and technology assumptions. In the High Oil Price case, the price of Brent crude oil, in 2018 dollars, is assumed to reach $212 per barrel by 2050, compared with $108 per barrel in the Reference case, and $50 per barrel in the Low Oil Price case. By 2050, NGPL production reaches 6.3 million b/d in the High Oil Price case, compared with 5.8 million b/d in the Reference case. NGPL production in the Low Oil Price case remains relatively flat, averaging less than 5.1 million b/d from 2019 through 2050. The Resource and Technology cases produce the widest range of NGPL production and are principally defined by assumptions about the estimated ultimate recovery for shale gas, tight gas, and tight oil wells in the Lower 48 states; undiscovered resources in Alaska; and the offshore Lower 48 states. In the High and Low Oil and Gas Resource and Technology cases, these recovery rates are 50% higher or 50% lower, respectively, than in the Reference case. Rates of technological improvement that reduce costs and increase productivity in the United States are also 50% higher or 50% lower than in the Reference case. The higher case also includes additional unidentified tight oil and shale gas resources to reflect the possibility that additional layers or new areas of low-permeability zones will be identified and developed. 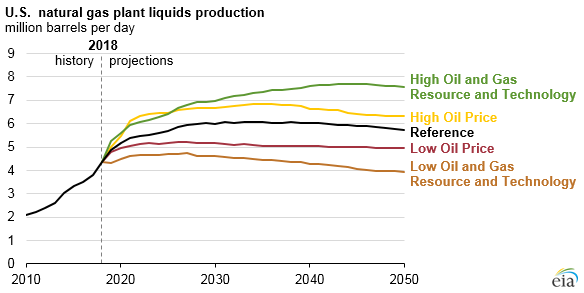 In the High Oil and Gas Resource and Technology case, NGPL production reaches a peak of more than 7.7 million b/d by 2045 compared with nearly 4.4 million b/d in 2018. In contrast, in the Low Oil and Gas Resource and Technology, NGPL production declines by 10% between 2018 and 2050, dropping to about 3.9 million b/d by 2050.